The Heathered Eyelets Wrap is modern, beautiful and easy to work up. Basic stitches produce beautiful eyelets, making it a fun project to crochet and is perfect for anytime of year. Self-striping yarn is a great option for this pattern, but it would equally beautiful in a solid color yarn too! Oh, yes, this one calls my name. 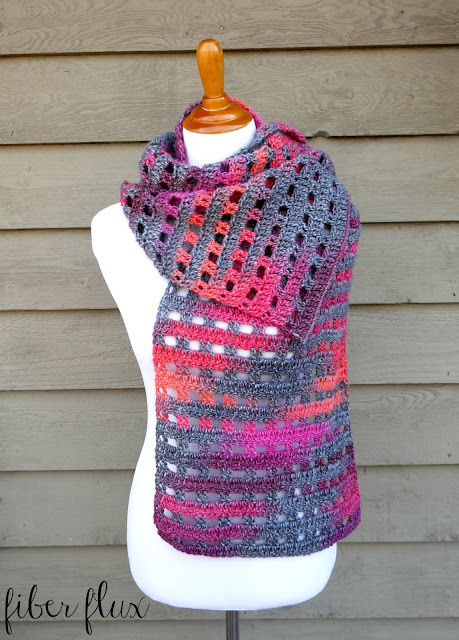 It would be perfect for cool evenings at the shore! Thank you. Another beautiful pattern and I've been wanting to make a shawl for along time now. I can't find the I love crochet magazine in stores. I was looking for it since the last time you appeared in it with another beautiful shawl. Bummer. I love the wrap, but would need it wider than 14". Are there any instructions for making it wider? What is the yarn weight for this project? Could you suggest a substitute yarn to use? I'd like to buy another yarn to make a sample swatch. 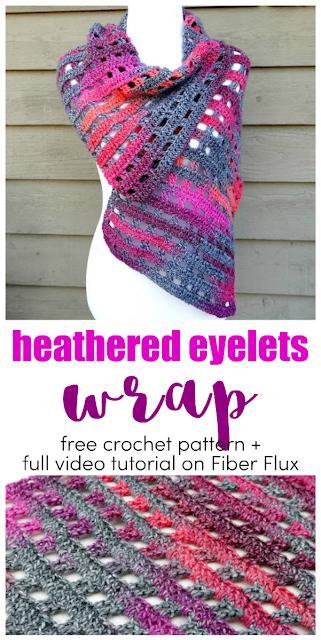 The Heathered Eyelet's Wrap is gorgeous! Thanks for Another Lovely Project! 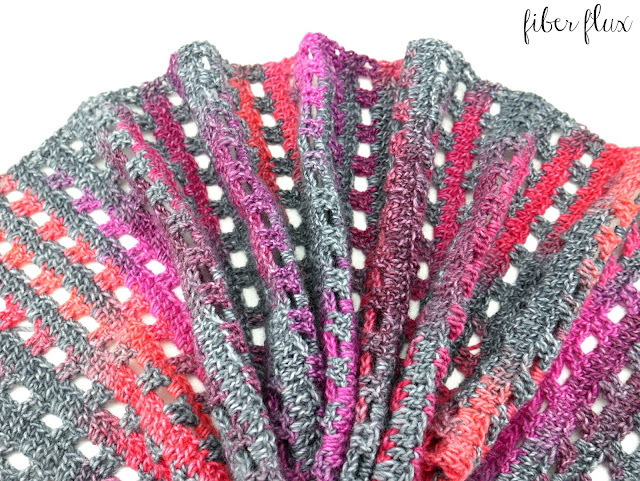 Love, love, love this pattern! Great tip using a larger hook for chain (used 9) and went back to 6.5....used a light pink self-striping, working up nice - so pretty !! Please would you give instruction for making this at least four inches wider! I also need instructions to make this about 4" wider! Hi! I just made this using the Loops and Threads new facets yarn. How do I upload a picture for you to see it? 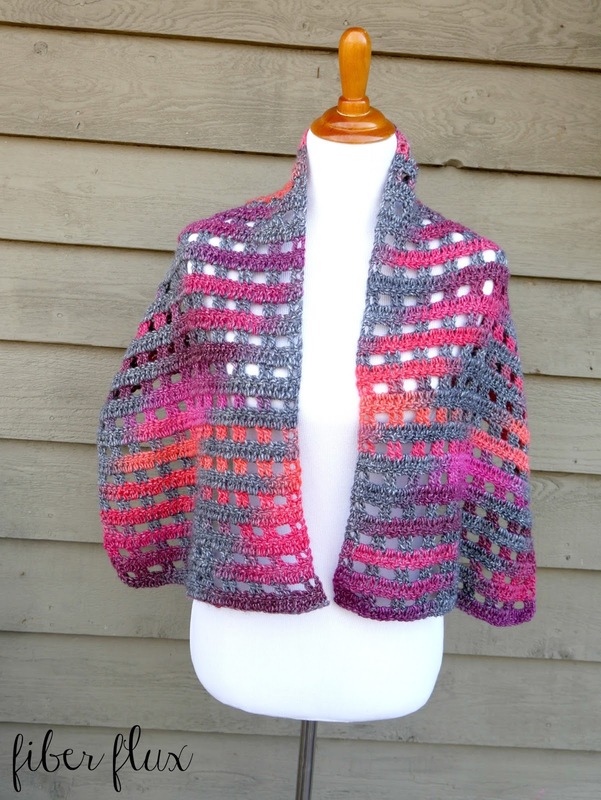 Made this shawl last year and it was beautiful! But would love to make it wider. Could you please forward directions to make wider? 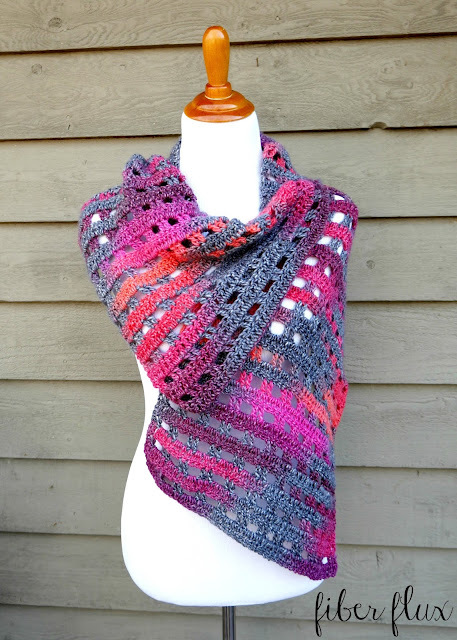 Made this shawl last year and it was beautiful! Would love directions though to make it wider! I need the multiples for a scarf. Thank you Brenda Peterson. To make it wider: The pattern is 4 stitches wide (2 dc, 2 ch) so increase your starting chain by multiples of 4 until you have the width you need. Then do row 1, etc, as written. Check your width after you complete row 1. Loved this pattern. I made mine much wider, started with a chain of 68 - this made it about 60cm wide. I used just under 3 Fiddlesticks (Caron) Cakes for mine and that made it quite long about 200cm. But I wanted a nice long wrap and as I am a larger lady I needed it longer to be able to wrap right around. I love it. Thanks for a great pattern. Oops - my previous post said the starting chain was 68, but it actually was 88. Sorry. Hi & thanks for sharing so glad someone else made it wider. I think it's absolutely beautiful. 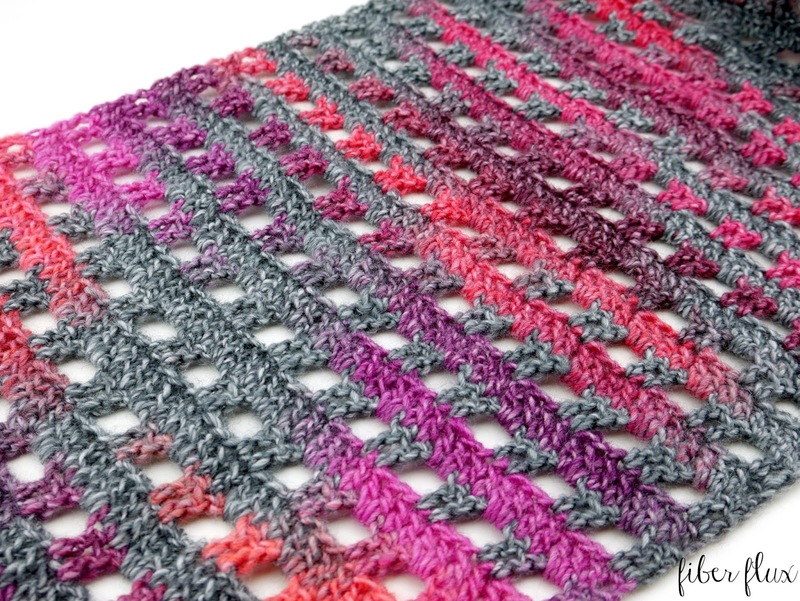 I wanted to make a shawl and throw using this stitch. Thanks for correcting your count MrsCraftyChris. I will add in 20 until I get the length I need for my throw.